With the flourish of at least 27 ceremonial pens, Gov. Bruce Rauner, flanked by Republican and Democratic legislators alike, did something Monday for the first time in his nearly 3.5 years as governor: he signed into law a new state budget. That Illinois has a spending plan – a $38.5 billion budget which passed on time and received support from members of both parties – is notable given recent precedent. Illinois social services, higher education, even vendors that contract with the state to do business, all languished during 2.5 years of unprecedented political deadlock in which lawmakers failed to pass a budget. That logjam broke last July when a dozen mutinous Republican lawmakers joined with Democrats to pass an income tax increase over Rauner’s objections. The new fiscal year 2019 budget that will take effect in July spends approximately $5 billion Illinois will bring now that the individual income tax rate is 4.95 percent instead of 3.75 percent and the corporate rate is 7 percent, up from 5.25 percent. 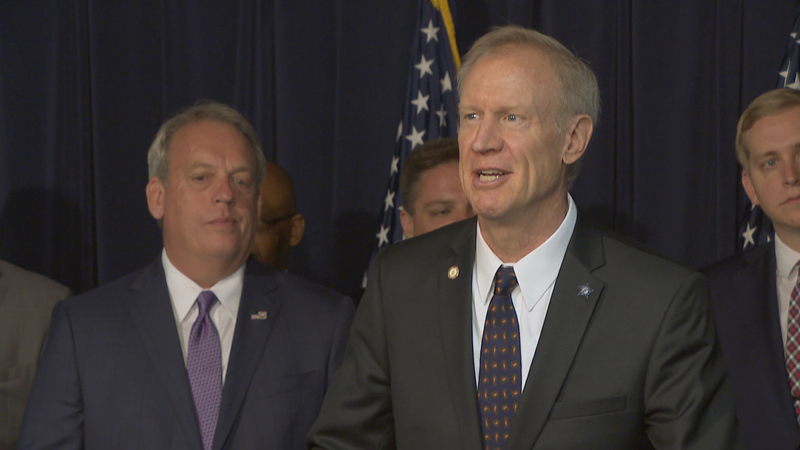 Rauner, who is campaigning for a second term with the promise of partially rolling back that hike, said it is not disingenuous for him to herald the new budget as “balanced” given its reliance on the tax bump. “This is bipartisan compromise. This is a comprise. It’s not perfect. None of us got everything that we were looking for,” Rauner said. Rauner says Republican were able to rein in “excessive spending” in the budget deal, and said it was possible to reach an agreement in part because Democrats for the first time went along with a series of pension changes, albeit narrow ones unlike the more comprehensive overhaul advocated for by Rauner, which could bring Illinois significant savings should it pass legal muster. The scaled-back pension changes will allow two groups of former state employees, teachers and university workers (those who have left their state jobs but are not yet drawing pensions, and current retirees who are collecting a pension) a buyout, in which they will receive a lump sum up front in exchange for giving up all, or partial, benefits in the long run. The plan also requires local governments, particularly school districts, to pick up more of the tab if employees and teachers are given end-of-career salary hikes that boost their pensions. Otherwise, the deal contains none of the ”structural reforms” that Rauner so wanted, and Democrats so opposed, that each side was willing to let the state go without a budget for years. Rauner said he will continue to advocate for those “structural reforms” because only with them will Illinois be able to keep the budget balanced and to up its economic competitiveness. Among the budget highlights: A $5,000 tax credit for adoption services, a new merit-based university scholarship program and a revamp of the Monetary Award Program that will allow low-income students to get four years of grants, a half-billion dollars toward the University of Illinois’ planned Discovery Partners Institute in Chicago’s South Loop, and initial funding for a new veterans’ home in Quincy. The budget does not, however, make a dent in Illinois’ backlog of unpaid bills, which currently stands at more than $7 billion. Nor does it take into account what is expected to be hundreds of millions of dollars owed to state employees who are members of the American Federation of State, County and Municipal Employees, pending a court battle over their contract. The budget also relies on one-time revenues, such as sweeping special state funds and the sale of the James R. Thompson Center – moves that will create a hole in future budgets, or in this one should, for example, the Thompson Center sale not move forward. On Monday, Rauner nonetheless “personally” thanked both Madigan and Cullerton by name.